Nevermore guitarist Jeff Loomis showed his skills at the bands albums, but in 2005 he announced that the will take a break between albums and work on a solo album. It took him awhile, but finally he had 10 tracks and started off recording. The drums are played by ex-Nevermore drummer Mark Arrington - who did a great job! - and with Pat O'Brian another former Nevermore member was involved, playing guitar on one track. The opener is called Shouting Fire At A Funeral and indicates that even if this is a guitarists instrumental album the focus is the song! In a way Loomis didn't changed his way to write songs too much, just that his guitar is taking over the melody line and hooks up the listener. Sure, he demonstrate his skills, but not like so many other great guitarists! Usually I'm not a fan of instrumental albums, but at Zero Order Phase I don't miss a singer. A faster one is Opulent Maelstrom where he combines progressive elements and structures with heavy riffs and fast double bass drumming. He varies from progressive passages to almost thrashy parts - and surprises the listener once more. With Jato Unit he introduces the first guest - Ron Jarzombek (Watchtower). Well, here is pushing it a bit too far... And so Azure Haze is giving the listener a bit of a break, as this one is slower and atmospheric... This can carry you away and afterwards you are ready for some more shredding... For Cashmere Shiv he got Michael Maning to add the bass and producer Neil Kernon picked up a guitar and joined in. Btw, Neil Kernon did a hell of a job on this album! Cashmere Shiv is showing fast drumming, lots of breaks and staccato riffing, but also some furiously played solos and slow passages. On Race Against Disaster former Nevermore guitarist Pat O'Brian joins Mr. Loomis. Not a big surprise, coz they always played together well, but people who only know him from Cannibal Corpse might be surprised. It seems that Jeff Loomis was aware of the fact that fans might be overtaxed and so he gave the listener another break with the slow Sacristy. The tune starts slowly and the guitar seems to sing again, but later he adds some heaviness and put on top another breath taking solo. And when the album comes to an end he offers us with Departure a song which starts slowly... This one would even work acoustically... And so the album kinda fades out. 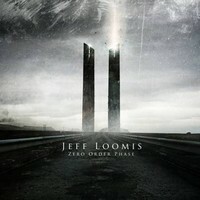 On Zero Order Phase Jeff Loomis shows his brilliance and a side he can't show in Nevermore. All songs played at an extremely high level, a demonstration for other guitarists - and some might consider giving up! But even if the album offers a variety of sounds, it won't please everybody! So check it out first! I recommend Opulent Maelstrom, Sacristy, Cashmere Shiv and Race Against Disaster.